I have had a few requests to review the Bare Escentuals stuff that i have or have tried, which i apply to my face. :) So here you go lovelies. 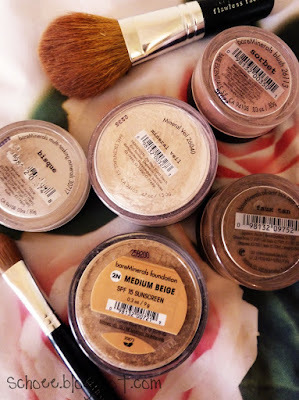 I have used Bare Escentuals now for 3 years. I first heard about on the shopping channel...QVC i think it was, and before that me and my mum had never heard of minerals for your face & neither of us used powder. I was always a liquid girl. My mum actually never even wore foundation until we both decided to take the plunge and buy ourselves some Bare Escentuals. Besides the 9g foundation, we also ordered a 2g concealer, the concealer brush, and the flawless foundation brush. The Mineral Veil Pesonally, i don't think i need to use this too often. If i'm going out and have used liquid foundation and have cream blusher..the full works shall we say, I do like to use this. 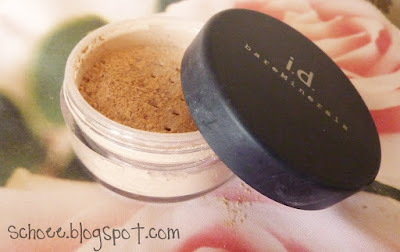 But since i have quite dry skin, i get kindof scared to apply this to powder foundation, incase of powder build up. Even though, this is SO finely milled it doesn't do that. For those of you who like a translucent powder to set, i cannot reccommend this highly enough. I really do love how soft it is. Let me start by saying, this is my HG foundation and i do go out and buy others in the curiosity they will be any better. But this always wins. Even though i have dry skin, this foundation really works for me. I do find that when i wear a liquid foundation, it sits in all my dry patches and the colour then becomes patchy. The coverage of this is SO natural and doesnt look powdery or cakey whatsoever. I always recieve compliments on my skin when i'm wearing this...it's not "what foundation do you have on" it's, "You look really glowing today"
I have repurchased this foundation 5 times over the last 3 years, and i can saftely say i would buy it over and over and over. It's also really good for your skin, as it does contain minerals. Personally, i have found this to reduce blemishes so much quicker, and i really believe it helps with the healing process. added bonus! My colour shade is "Medium Beige", so if you are around an NW20 in mac colour, this shade would be perfect for you if you are wanting to try it out. I really do love this foundation, and so far is the only thing that can make my skin look good for long periods of time. A million thumbs up for this. I use this absolutely everyday without fail. 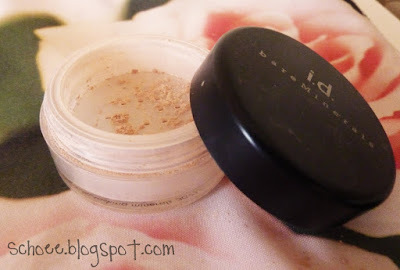 My Nars Laguna is collecting dust since this came along. 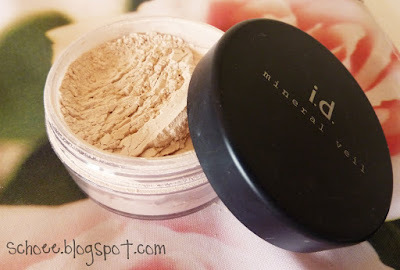 Alot of people may be put of this as it is a loose powder, but i actually just find it easier to blend, and has a much better effect, alot more airbrushed. "Bisque" Concealer The first of the products i could probabaly live without. I love the effect it has when my skin isn't so bad, and i just have a few minor blemishes, as it really blends in well, whereas sometimes a cream or liquid concealer would be more difficult to blend into the skin/blemish. Although saying this, i have almost finished it..but then i have had this for 3 years haha. If you have very minor blemishes, or small dark circles, i would reccommend this to you, but if you're like me, and you insist the problem is alot worse and needs maximum coverage, you will most likely be dissapointed in this. "Sorbet" Blush This is SO pretty! One thing i love about these mineral blushes is how natural they look. 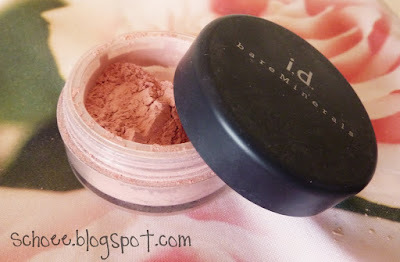 When i have buffed this into my cheeks, it looks like i am naturally blushing haha. This colour in particular is a very warm, light pastel peachy pink & is a matte finish. If you don't already own a BE blush, and you are a blush fiend, then what are you doing WOMAN, get yourself on one of the sites below and buy buy buy. 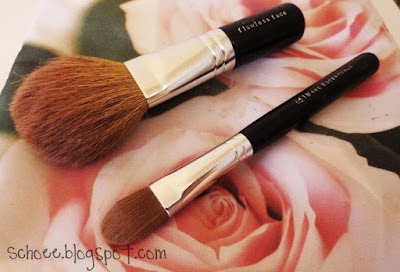 The Concealer Brush - This is my HG concealer brush. If i don't use my fingers, i'll be using this. The bristles are compact, which is awesome as it means good coverage, but the size of the brush is what i love so much about it. I just hate small concealer brushes. They're great for tiny little blemishes, but when you want to cover a larger surface area, theyre pants. And usually, i will be wanting to cover a large surface area haha. 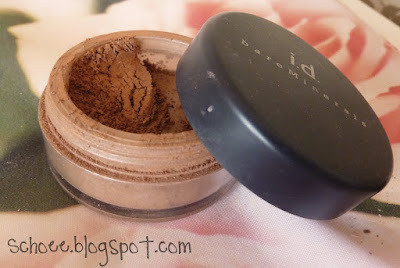 I don't just use this brush with the minerals, infact i think it works just as well with any cream or liquid concealer. Where do i buy all my minerals i hear you cry? The first is GLOWGIRL, this is a UK site, however, they ship for free worldwide, and i have never had such amazing online service through any other site. I'll order on the thursday, paying cheaper prices that in stores or on QVC, and i will recieve it either the following day, or the day after..for free. I highly reccommend this site, have used it for three years and never been dissapointed. You can even earn points! So that's my review of the face products i have and have been using for a long long time. I'd really love to try out some of their eyeshadows, as i've heard some great things about them. If anybody has any reccommendations for shades they think i'd like, do let me know.